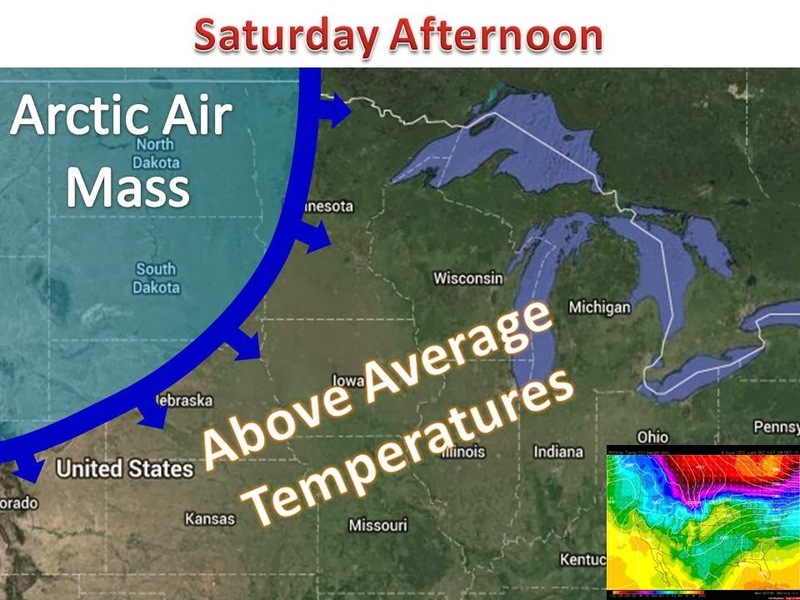 The coldest air of the season will surge into the Midwest on Saturday and Sunday. As for Saturday, "warm" weather will be the story as highs in the 40s, 50s, and 60s will take hold ahead of the front. Enjoy the nice weather while it lasts! One thing to watch for: As the snow melts and puddles on roadways, a possible flash freeze is possible as the front cools things down rapidly. 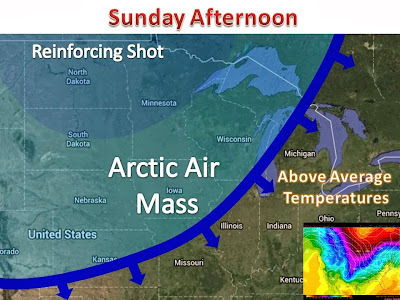 As the colder air moves through (Saturday night into Sunday for most places) a few snow showers are also possible with a dusting to an inch possible from Minnesota to Michigan. As for Sunday: Most of you will see your high temperature in the early morning before the front moves through later in the day. Temperatures will drop throughout the day. Winds will shift from the south to the north and wind chills will become a problem on Sunday afternoon. 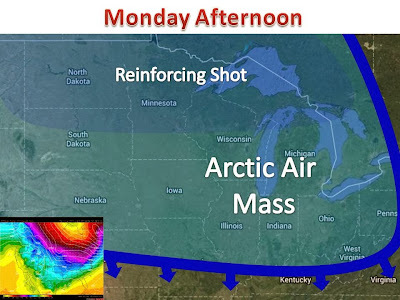 The combination of winds and cold temperatures winds will drop below zero by the evening, in most places. 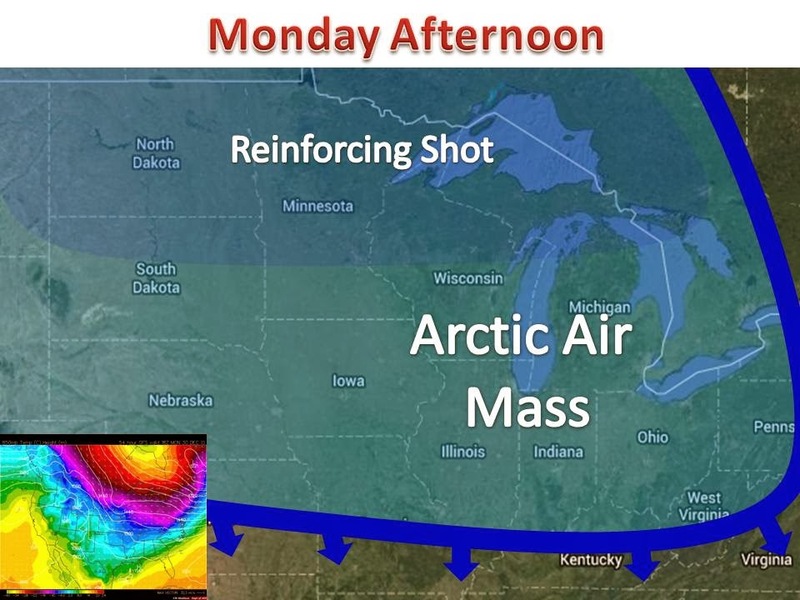 By Monday, the arctic air will have settled in. Many neighborhoods in the northern half of the Midwest will struggle to reach zero as a high temperature! Wind chill advisories and warnings will will certainly be issued, with indices approaching 50 below in some places, especially in the darker blue shading on the map. Much of the same for Tuesday. As you head out for New Years Eve celebrations, bundle up, and bring necessary gear to stay warm just in case your car breaks down.